If you are in the position of hosting a horse show, you know that attention to detail and polish can really make the difference in how your show is perceived. This is important because happy spectators and exhibitors will return to your venue, tell friends, and help make your show a success. One way to make sure your show gives the best impression is by having professional horse show jumps. If you have people at your barn that jump, you probably have some jumps already in place. 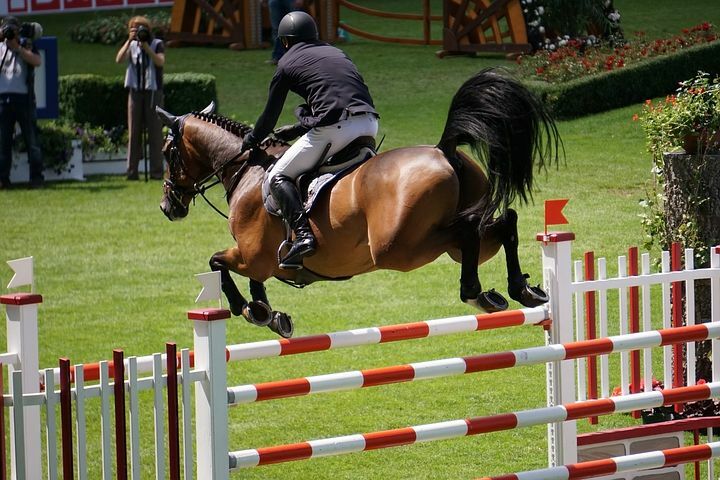 During the early stages of show planning take an objective look at what you have available and decide which jumps are suitable for the show. You can then fill in around those items to create a great looking course. If the majority of your fences are showing wear, it may be time to invest in a new set of horse show jumps. If you have some fences in good condition, and are looking to round out your course there are some easy things you can do to create a good looking, inviting hunter or jumper course. Adding some flower boxes is a great way to spruce up your ring. They can be used as actual fences for the smallest short-stirrup riders, and dress up the ground line of more experienced riders. Adding a faux stone or brick wall is another way to add polish to an existing course. These are fences that many people may not get to jump on a daily basis, so adding them to your course will encourage repeat riders. Roll tops are another good addition that many riders don’t get the opportunity face on a daily basis. Don’t overlook the appeal of adding a special fence to promote your show. A professional jump company will be happy to provide custom painting for your fence. You can offset the cost by seeking sponsors for the fence. Many local companies would be happy to sponsor a fence at a local show, knowing that the fence would be used for years to come.